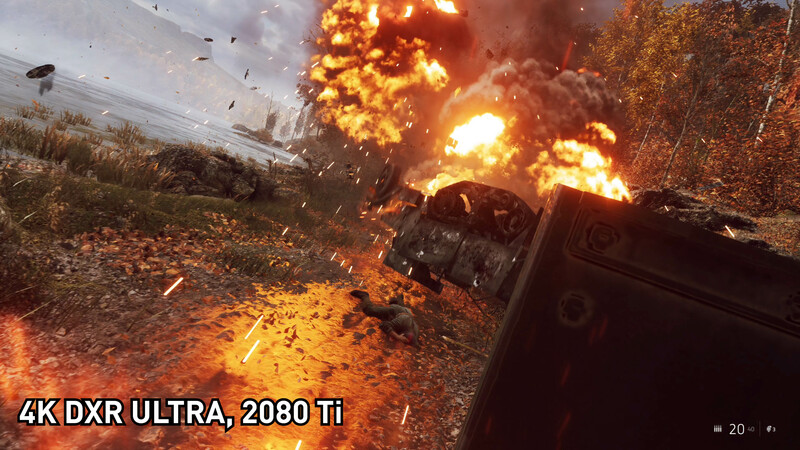 Real-time ray tracing is finally here and today we’re exploring how it looks and performs in the first game to support it fully: Battlefield V. In this article we’re not only benchmarking the three GeForce RTX cards across all the ray tracing presets in the game, but we’ve also got some great comparisons for you to show exactly the difference between RTX on and RTX off. 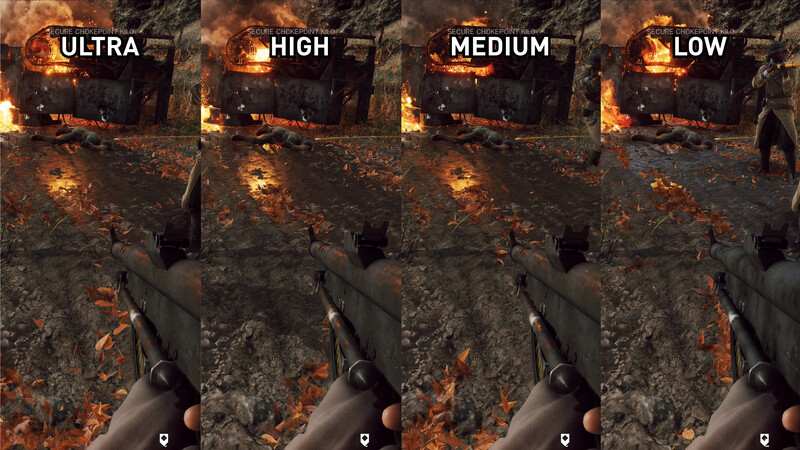 We’ve already touched on Battlefield V’s GPU performance and we found that it runs pretty well on Ultra settings with a range of graphics cards. Nvidia’s new RTX cards do particularly well, with something like the RTX 2070 being able to play at above 120 FPS at 1080p, or well above 80 FPS at 1440p. Naturally, the RTX 2080 Ti is a beast at both those resolutions, with framerates above 140 FPS. But we now have ray tracing in Battlefield V and since the RTX cards launch, the big question has been how the game would perform once this taxing effect is enabled. Nvidia has been careful not to show any official performance figures for the effect running on even their flagship RTX 2080 Ti, but we’ve seen plenty of reports from those that have tried an early demos, suggesting we’re looking at a 1080p 60 FPS experience at best. In order for Battlefield V to support ray tracing, you need to download the Windows 10 October 2018 update version 1809 which adds support for Microsoft’s DirectX Ray Tracing technology, or DXR. This OS update was delayed for a few weeks due to a nasty file deletion bug, but Microsoft has just resumed the rollout now. You’ll also need to update Battlefield V to the latest version through a hefty 16GB patch, and install Nvidia's latest GeForce 416.94 drivers. Once that's done, load the game, enable DirectX 12, then enable DirectX Ray Tracing Reflections. From there you’ll have access to four preset options for DXR: Ultra, High, Medium and Low settings. If you just use the presets rather than custom settings, the DXR mode corresponding to your preset will be selected. You’ll also see here that DICE isn’t using GameWorks to integrate ray tracing, instead sticking to a basic, cross-vendor DirectX Ray Tracing implementation. RTX, which is Nvidia’s ray tracing technology platform, sits below DXR and is the tech that essentially translates DirectX ray tracing requests, into stuff the GPU can actually work with. 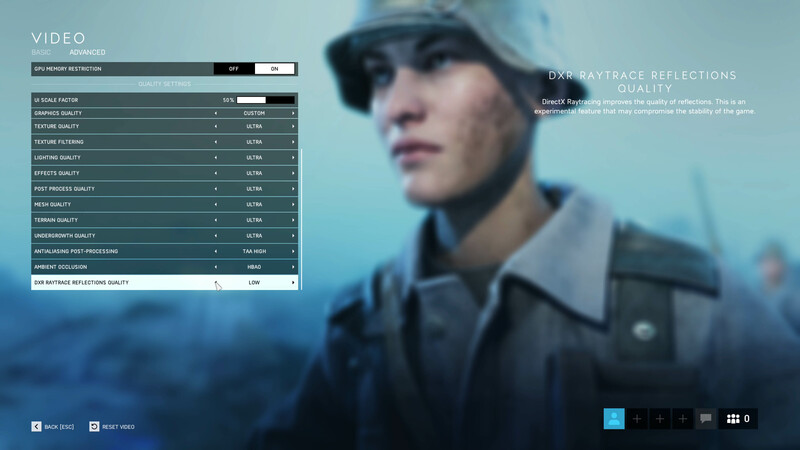 So how does DXR actually look in Battlefield V? Above is a direct comparison of the four presets, and the first thing you should notice is there’s a large visual difference between Ultra and Low, but there’s not as much of a difference between Ultra and Medium. In fact, there is basically no difference between the Ultra, High and Medium settings for DXR reflections, and it’s not just in this scene. 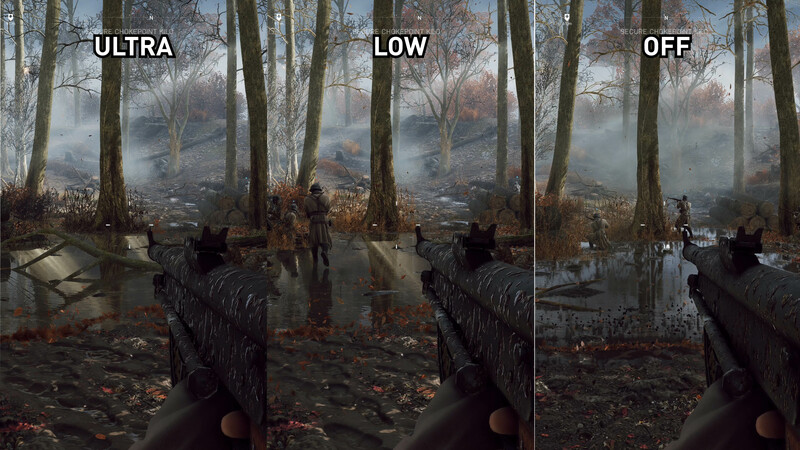 We tested several other sections of the game and couldn’t spot any difference between the three higher settings. This leads me to conclude that there are only two DXR modes: Ultra, which applies the full complement of ray tracing reflections in the game, and a cut down Low mode for better performance. Both the low and ultra modes apply reflections to surfaces like water, puddles and shiny objects, but it’s only the ultra mode that also applies these reflections to more matte surfaces like mud and your gun. You’ll spot in this scene for example that the ultra mode reflects the fiery vehicle wreck off the muddy surface in the front, as well as on the barrel of your weapon at some distance away. Switch down to low, and the reflections disappear on your gun and from the mud, leaving just reflections from the water’s surface. From what we can tell, this is the main difference between the two modes. The quality of reflections in terms of resolution, accuracy and draw distance is unaffected, so you’ll get the same sort of experience looking at those shiny surfaces whether you’re playing on Ultra or Low. Switching it down a notch only affects the amount of materials and surfaces that RTX reflections apply to. Ultra, in my opinion, gives a far better and more realistic presentation and really shows off the quality of ray tracing. One of the main questions we've seen so far is how does ray tracing compare to the game’s standard reflection mode, screen space reflections? Undoubtedly DXR provides a more realistic presentation, with far greater reflection accuracy and resolution, and of coursem the ability to reflect objects that aren’t necessarily in your field of view. Screen space reflections are only able to reflect objects present on the screen, so things outside the field of view are crudely cut off in an unnatural way depending on the angle of reflection. You’ll notice in the DXR off footage that anything passing over the reflected area, like the falling leaf particles or other people, causes artifacting in the reflected area and looks pretty ugly. 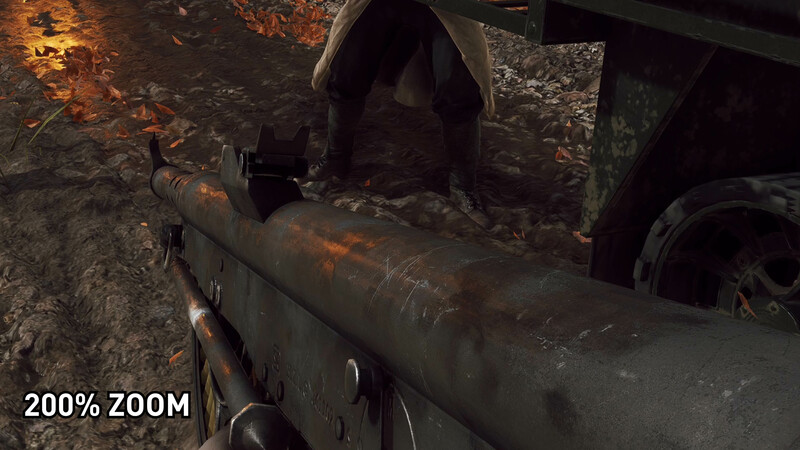 This was the same in Battlefield 1, so it’s not like DICE has specifically downgraded reflections in BFV only to upgrade them again with ray tracing. These issues aren’t present with ray tracing, instead you get nice, accurate reflections in real time. But there are some issues with DXR as well. In this scene with a large puddle, DXR seems to be reflecting godray type lighting effects that don’t actually exist in the non-reflected world. One of these effects also is bizarrely cut off. Then in the footage showing reflections on the surface of your gun, reflection quality is quite low, with almost a video encoded blockiness to the effect, even at 4K. Reflection resolution of water doesn’t seem to be impacted nearly as much by this low resolution effect, in fact, I’d say the quality of those reflections is very good. 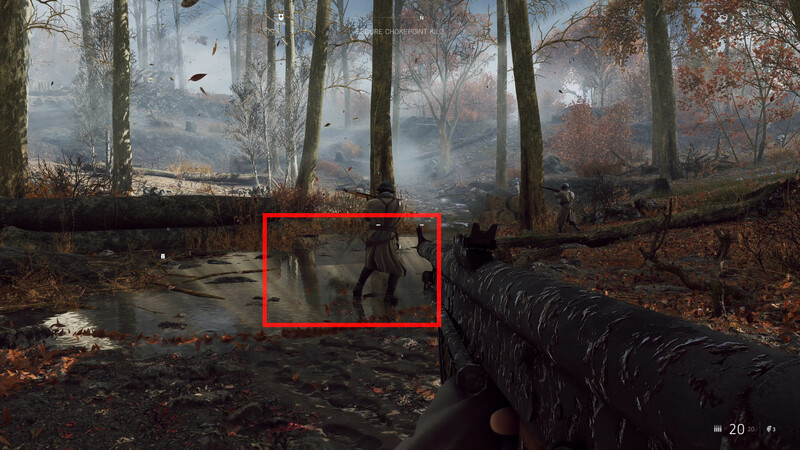 It’s also worth pointing out that ray traced reflections is the only ray traced effect in Battlefield V. Every other aspect of how the game is rendered is done through traditional means, so shadows and ambient occlusion, for example, are the standard game effects. This means that if you’re not in an area with reflective surfaces, you basically aren’t getting any benefit from DXR. Let’s talk performance. And here’s where it all falls apart for ray tracing, because performance is absolutely horrendous even if you have a flagship RTX 2080 Ti. And just wait until I show you the results from the RTX 2070, because it’s… well you’ll see in a moment. For this testing we used all three of Nvidia’s RTX cards running on a Core i7-8700K test rig, and we tested at both 1080p and 1440p. For reasons that will become quickly apparent, we didn’t bother testing at 4K. 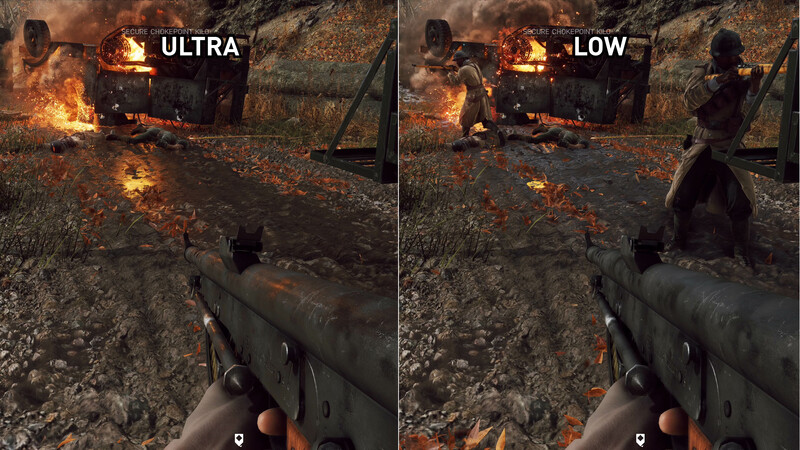 All other settings were set to Ultra, and we only tested with the Ultra and Low DXR settings, as well as DXR Off. There was no performance difference between Ultra, High and Medium for DXR reflections. Our test run was during an intensive part of the single player campaign with lots of reflective areas, we also did some spot tests in multiplayer, but it’s hard to get consistent, accurate results only testing in the multiplayer part of the game. In any case, we didn’t see any significant performance differences between single player and multiplayer in similar environments. These first results were run with the fastest gaming GPU you can buy today, the RTX 2080 Ti, and boy is it not looking pretty. At 1080p, the game comfortably runs at 150 FPS with DXR disabled but as soon as you crank it up to Ultra performance tanks, dropping below 50 FPS. In other words, performance is cut to a third. Switching down to the Low mode does improve things somewhat, although we’re still facing half the framerate we once had. And even with an RTX 2080 Ti, it’s only at low DXR settings at 1080p that we’re looking at average framerates above 60 FPS. Then at 1440p, it’s nightmare territory. Using the Ultra DXR mode, performance is roughly one quarter of what it was with DXR off, while the framerate was more than halved using the low mode. Neither setting can deliver 60 FPS with an RTX 2080 Ti. The game is smooth and very enjoyable with DXR off at 1440p with this flagship GPU, but with DXR on, it’s not a walk in the park situation. Lets move to the RTX 2080. We’re only creeping above 60 FPS on average at 1080p with the low DXR mode. Pattern is the same, where performance is cut down to a third of what it was when using the Ultra mode, which in this case delivers around 40 FPS, an unacceptable mark for a first person shooter like this, even in single player. At 1440p the RTX 2080 delivers a 47 FPS average using the low DXR mode compared to over 100 FPS with DXR disabled. What we were the most afraid of, ray tracing performance with the RTX 2070 is laughable. The ultra mode delivers 30 FPS at 1080p, down from 110 FPS with DXR disabled. And with the low mode we’re unable to hit a 60 FPS average. The game is completely unplayable at 1440p with DXR on an RTX 2070 in our opinion. It is interesting to note across these tests that we are being RT core limited here. The higher the resolution, the higher the performance hit using the Ultra DXR mode, to the point where playing at 4K is more than 4x faster with DXR off. This also plays out when we spot checked power consumption: the cards were running at consistently lower power with DXR on, because the regular CUDA cores are being underutilized at such a low framerate. The degree to which performance is reduced does depend on how many reflective surfaces are in the environment though. Wet, muddy areas are the most heavily impacted. Playing in the city area of Rotterdam in multiplayer mostly had shiny reflective surfaces, so the performance hit wasn’t as bad as in our benchmark runs, but we’re still facing less than half the framerate with the Ultra mode. And then snowy areas seem the least affected with relatively good performance, namely above 80 FPS at 1080p with DXR on and a 2080 Ti, if you can count that as good. When it comes down to it, DirectX Ray Tracing and this first generation of RTX GPUs has played out exactly as expected. It was looking like performance would be terrible, and it is terrible. Just judging based on the demo footage, compared to performance you can get today, and it doesn’t look like there have been many significant steps towards getting ray tracing running at higher framerates. Now, real time ray tracing is a significant graphical achievement, it’s something that has been impossible to produce on a single GPU before, and is likely to become the future of the graphics industry. 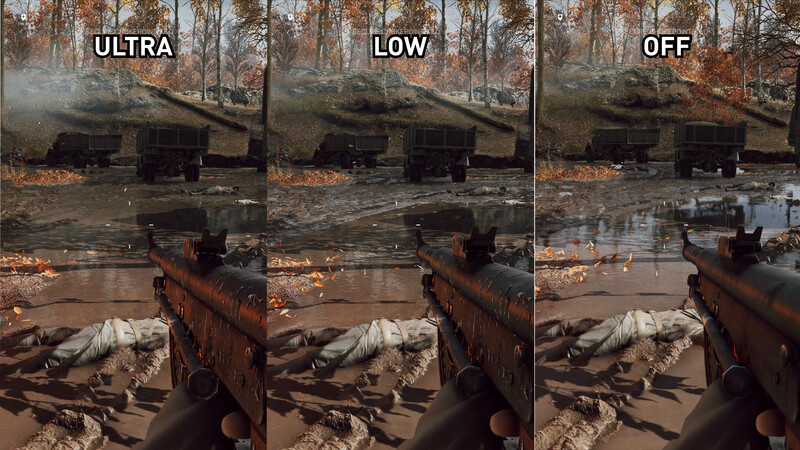 But right now, there is basically no reason to enable ray tracing in Battlefield V, because the performance hit is so severe it impacts the experience massively. We’re in a situation where the RTX 2080 Ti is only somewhat playable with DXR enabled at 1080p, while 1440p is borderline and 4K is out of the question. Then with the RTX 2080 you might be able to scrape by with the low mode at 1080p, and in our opinion the RTX 2070 is not suitable for ray tracing at all. And that’s just looking at DXR performance on its own. With DXR disabled the game looks great and runs at excellent framerates with RTX cards. We’re talking well above 100 FPS on all three cards at 1080p. 1440p is also very playable at high framerates on even the RTX 2070, and you can even enjoy 4K gameplay, particularly on the 2080 Ti. 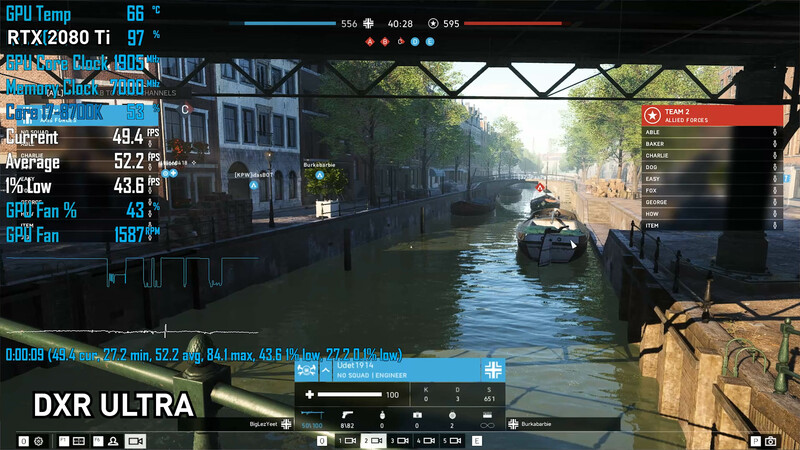 Going beyond the raw performance and comparisons in Battlefield V, real-time ray tracing was meant to be the key selling point of GeForce RTX cards. In practice, I don’t see gamers moving from 130 FPS with the still visually impressive ultra graphics to 40 FPS with better reflections. The quality improvement from DXR reflections is nice, but you’ll be hard pressed to spot the difference in fast paced motion. Screen space reflections, while not perfect if you stare at a puddle for hours, do a decent job of approximating reflections at a respectable performance cost. And when you’re more focused on running around and shooting enemies, I’d say it’s almost impossible to tell the difference between SSR and DXR reflections. Going beyond the raw performance and comparisons in Battlefield V, real-time ray tracing was meant to be the key selling point of GeForce RTX cards, with Nvidia using this technology as a way to justify the higher price on these cards compared to their GTX predecessors. It was meant to be a game changing feature, something that would revolutionize your gaming experience with crazy levels of visual quality. At least with Battlefield V, the quality improvement doesn’t come anywhere close to justifying the insane performance drop you’ll experience with DXR enabled. RTX in this game simply isn’t a reason to buy the RTX cards. When you spend the big bucks on a RTX 2080 Ti ($1,200), you want to be playing this game or any other game at more than 100 FPS at 1440p with all the eye candy turned on. You don’t want to cut that down to below 60 FPS, and you should be getting well over 60 FPS at 4K, let alone on 1080p. For real time ray tracing to become the future of graphics technology, we need more computing power. Specifically, we need more RT cores in Nvidia’s GPU architecture, because the 68 cores provided with the RTX 2080 Ti allowing for 10 Gigarays per second isn’t cutting it. This may be a stepping stone to getting ray tracing supported in games, and to show the technology off to the world, but consumers shouldn’t be paying a premium right now to run what essentially amounts to a tech demo on their PCs. Nvidia is understandably excited. They released this short behind-the-scenes video for the DXR launch showcasing their work along with EA and DICE to deliver ray tracing effects in Battlefield V. Perhaps a RTX 280 Ti SLI rig will do nicely (not a buying recommendation). And honestly, Nvidia should have been far clearer about what to expect from ray tracing when they announced their new GPUs. It’s all well and good to announce real time ray tracing as a major new feature, but buyers are going to be disappointed when they purchase a $1,200 product only to find out using that feature results in awful performance. If ray tracing had been presented as more of a look into the future, rather than a feature ready for prime time in today’s games, it’d be much easier to swallow what is being dished up in this initial release. The RTX 2070 deserves a special mention, because this card can barely be classed as ray tracing compatible. Delivering performance barely over 30 FPS at 1080p with DXR reflections set to low, it’s clear that 36 RT cores and 6 gigarays per second of ray tracing performance doesn’t cut it for actual real time ray tracing. We’d be bitterly disappointed if we bought an RTX 2070 for ray tracing, only to be left with that sort of performance. We're expecting a similar story with other games that are set to use ray tracing in the future, such as Shadow of the Tomb Raider and Metro Exodus. Everything we’ve seen from DXR demos suggest we’re facing a similar performance penalty to Battlefield V, for a similar small increase in quality. We’ll test those games with ray tracing as soon as we can, but we wouldn’t be holding out for anything better in future titles.